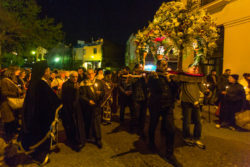 Written by GreekBoston.com in Greek Easter Traditions, Religion Comments Off on Why Do Greeks Have An Outside Procession During the Good Friday Service? 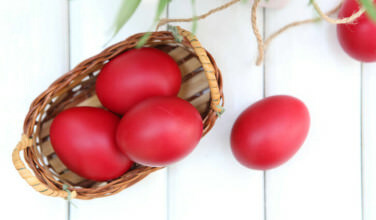 Easter is one of the biggest holidays in Greece and amongst those of Greek Orthodox descent living outside of Greece, and there are many cultural and religious aspects to that time. Easter Sunday is preceded by Holy Week, and there are church services that take place throughout the week. One of those services is the Good Friday Lamentations service, which takes place on Friday evening. As part of the service, the priest often forms a procession and goes outside. Why is this? What is Great and Holy Friday? During Holy Week, the Orthodox Christian Church mimics the events that led to Jesus Christ’s death and resurrection. On Great and Holy Friday, He dies on the cross. Most churches host two services – one in the afternoon and another during the day. At the afternoon service, Jesus dies on the cross. In the evening, the service is centered around mourning Christ’s death. This is referred to as the Lamentations service. What is the Lamentations Service? During the evening service, the priest removes the Body of Christ from the Cross. Most Greek churches have a large cross with a removal representation of Christ’s body. Once he takes down the Body of Christ, referred to as the Epitafios in the Greek Church, the priest and the alter boys make a procession. At this point, the priest may choose to go outside. After the procession is done, the body is placed in the Sepulcher. 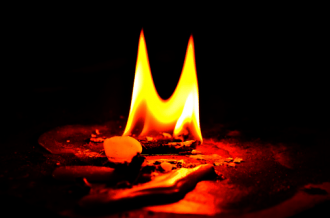 Why Do We Go Outside During Holy Friday? So, why would the priest choose to go outside? This is actually optional and is more of a traditional than a religious certainty. The only requirement during the service is that the priest takes the Epitafios down from the cross and then makes a procession while singing certain hymns. As long as the procession occurs and certain hymns are being sung, going outside isn’t necessary. However, they may choose to go outside especially if it is the tradition in that particular church to go outside if weather permits. After the procession ends, the Epitafios is laid in the Sepulcher and the rest of the service continues. The Body of Christ lies in the Sepulcher until Jesus is risen from the dead during the Holy Saturday service. 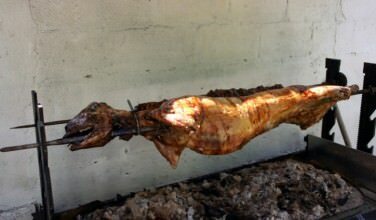 After that, the Greek people celebrate Easter. After the midnight service on Saturday, it is traditional to return home and eat a satisfying meal consisting of many of the foods that were forbidden during Lent. The Easter celebrations and traditions continue throughout the day.